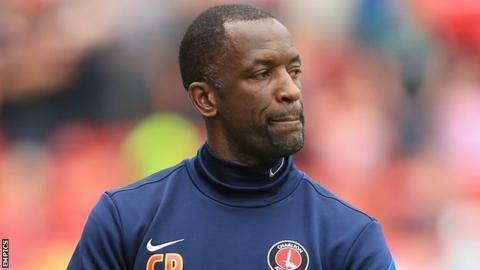 Charlton manager Chris Powell expects his side to halt the run which has seen them slip to 20th in the Championship. The Addicks have lost four of their last six games. He told BBC London 94.9: "Things aren't falling for us and when you're down there that happens. We've got to soldier on. "It's like this sometimes and we know this season will have plenty of ups and downs. At times I feel we can make better decisions. The signs are there." He added: "We are creating chances, especially in the last two home games. "We are very close but we are getting hurt. We keep knocking on the door and it's just not falling for us and people are throwing their bodies in the way. "It's been very up and down for us. I don't think I envisaged us having a season like we did last year; it's a very unforgiving league." Charlton won the League One title last season but Powell has told the club's supporters not to expect immediate success in their first campaign back in the second tier since 2008-09. "People will always level that story of Norwich and Southampton [who secured back-to-back promotions in the last two seasons]," he continued. "That's always unfair because you are your own club. "We don't want to pitch ourselves alongside those because we can only manage what we do; whether that's on the field, off it or financially. I don't want anyone running away saying we have to follow suit. "If we find ourselves in the lower reaches, as we do at the moment, we will stay calm and stay strong. "We have belief in ourselves."